An outboard motor hung on the back of a well used fishing boat is an iconic symbol of summer in the Northwoods. For years in the Northcentral Wisconsin lakes country of Oneida and Vilas counties, if someone had an outboard motor in need of repair, there was no question of where to take it - Duke’s Outboards. Dukes was a Northwoods institution for more than 60 years. 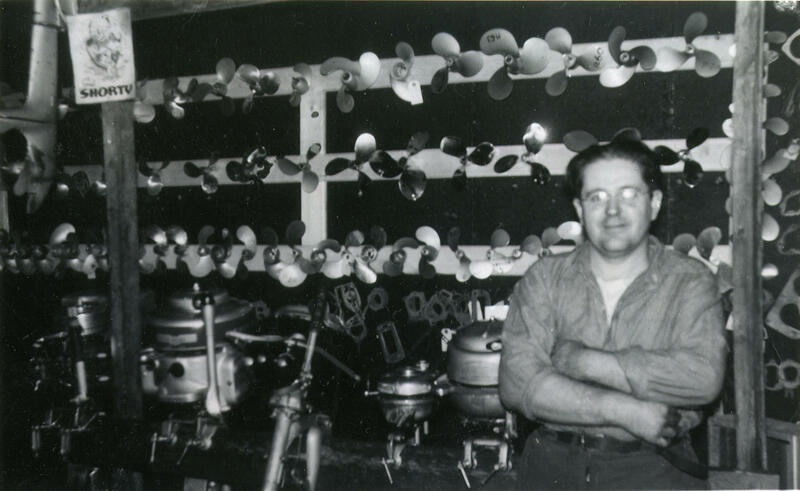 Duke Montgomery repaired and collected motors in his Boom Lake shop. Duke Montgomery’s shop was easy to find—you followed the white arrow signs from the main highway to the Wisconsin River just north of Rhinelander—and anyone could tell you that if you brought your outboard to Duke Montgomery it would be fixed, and fixed right. I had had the opportunity to visit with Duke and his wife, Dorothy late in their lives at an assisted living facility in Rhinelander. Though age and poor hearing made it difficult for Duke to communicate by that time, his passion for outboards was conveyed through his smile and shining eyes as he quietly told me about the early days. Vernon “Duke” Montgomery was just nineteen years old and a recent high school graduate in 1934 when he started his Evinrude dealership and outboard repair business in the midst of the Great Depression. After two years at the Brown Street location, Duke moved the shop north of town to a location on the Wisconsin River’s Boom Lake, where he would have water access. It was there that Duke’s Outboards truly became a northwoods institution. And the demand was growing - Duke was witnessing the development of a major American industry, an industry borne from Wisconsin resourcefulness and ingenuity. According to Duke, this “something” was the development of shrouded, or covered, motors. The two outboard models introduced by Ole Evinrude in 1934—the Imperial versions of the 5.5-horsepower Lightwin and the 9.2-horsepower Lightfour—were the first truly shrouded outboards. Through the years Duke worked on just about every type of American outboard made, and few knew an outboard motor as well as Duke. After devoting sixty-five years to the outboard motor business, age finally caught up with Duke and forced him to completely retire in 1999. Duke and Dorothy’s son, Jim Montgomery, who had learned the outboard business at his father’s side as a youth, took over the business from Duke. Jim carries on the Duke’s Outboards tradition of quality service from a new shop located not far from Duke’s original Boom Lake shop. A reminder of Duke’s legacy is an incredible collection of antique outboard motors that you can still be found in Rhinelander. Duke had collected them since the early days of his shop; beginning with those left for repairs and never picked up. Eventually there came to be more than a hundred outboards in the collection, one of the most diverse antique outboard motor collections in Wisconsin. Son Jim began to display several of his dad’s antique motors—representatives of different makes and models—at his shop, and also began collecting antique outboards himself. “People would come into my shop and be just fascinated with the old motors, but there were many more of my dad’s outboards in storage. I didn’t have space to display all of them,” Jim told me. As a tribute to his father, who passed away in 2004, and the Wisconsin outboard industry, Jim Montgomery spearheaded an effort to establish the Duke Montgomery Antique Outboard Motor and Boat Museum in Rhinelander. Duke’s outboard collection is the star attraction at the museum, which was established in 2005 and is located in the Pioneer Park historical complex.along with the logging and railroad museums. The museum’s collection of vintage pre- 1960s outboards as well as historic wooden boats manufactured in Wisconsin - including of the Rhinelander Boat Company - antique fishing equipment, and a recreation of Duke Montgomery’s old shop evokes thoughts and memories of simpler times on the water in the golden age of Wisconsin sporting life. Music Credits: "Georgia Steel Guitar," Curley Williams and His Georgia Peach Pickers, and "Spanish Bells," Cliffie Stone and His Barn Dance Band. It’s May and we’re still waiting for the ice to melt on most lakes in the Northwoods. Lake Superior is still about halfway iced over. But even when it’s thoroughly covered with ice, conditions can be treacherous. In today’s History Afield essay, we hear the story of Vern Frechette’s memorable trip out on the ice…one morning in March 1933. When the stock market crashed in late 1929, ushering in the Great Depression, the prosperity of the 1920’s screeched to a halt. As factories and mills closed their doors, millions of Americans found themselves unemployed. In today’s History Afield, WXPR Contributor Bob Willging tells the story of one man who left Chicago during the Depression to make his mark in the Northwoods. The resort industry in Northern Wisconsin goes back over 100 years to when tourists were first lured to the lake country on the heels of the lumberjacks. Small family owned resorts with cottages lining lake shores catered to fisherman in the early days. In the midst of Mom and Pop operations one man had a vision to build a Northwoods resort like no other. In today’s History Afield Bob Willging tells the story of the rise and fall of the Northernaire, the Waldorf of the Wilderness. Hunters and trappers spend a great deal of time alone in the woods, and outdoor activities in remote areas have their share of inherent dangers. Those dangers were even more apparent in the 1930s, a time of limited communication, large tracts of remote country, few heavily traveled roads, and the occasional gangster, moonshiner or poacher. In today’s History Afield, Bob Willging tells the story of one man’s mysterious death in the woods in 1931. Boaters can expect to see local volunteers at Northwoods boat landings this weekend wondering if your live well has been "drained". The "Draining Campaign" is a statewide initiative to get anglers to not take water from lake to lake.